Anglo-Peoples Korea/Songun: A CAULDRON OF FALSEHOODS- Staffordshire Branch of the UK Korean Friendship Association. A CAULDRON OF FALSEHOODS- Staffordshire Branch of the UK Korean Friendship Association. Some Western news agencies and networks, such as the BBC have sought fit to publish a torrent of lies and distortions concerning the role of women in the Democratic Peoples Republic of Korea. The purpose of this campaign is to use the recent international drive against sexual harassment of women and for gender equality and turn these issues against the good name of the DPRK. To exploit the important questions of female emancipation for banal political reasons is beyond contemptible. 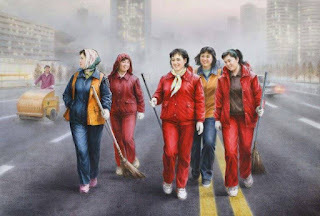 Women in the DPRK, have totally equal rights and responsibilities with men. The rights of women are enshrined within the DPRK constitution and female workers receive the same wages as their male counterparts. In the DPRK women play an increasing role in the fields of politics, academia, science, sports and music. Childcare facilities are free and widely available throughout the DPRK and women can take maternal leave with full pay. Korean style socialism greatly treasures the position of women and female participation in the struggle for national and social liberation goes back to the days of the Korean Revolution. Indeed, there is no antagonism between women and men in the DPRK, as there is in Western Countries. Reality tells another story about the situation regarding the dignity of women. The suffering of south Korean women by US troops started from the outrage committed on a woman by four US soldiers in March 1946 right up to the present day. For instance, two south Korean women Kim Chun Ja and Kim Jong Ae were assaulted in the barracks of the US military. The seedy practice of "Comfort Women", in other words, sexual slavery of south Korean women have been revived in the vicinities of US military bases. In the West, women have still not gained an independent and dignified role in society, despite the outpourings of "the politically correct ideology". We in the Staffordshire KFA utterly reject these false allegations made against Peoples Korea. Our branch regards them as part of the demonization campaign by the warmongers who are opposed to peace and reunification upon the Korean peninsula. Work for Peace, work for Korean Reunification, work for Solidarity with the Korean People, and join the Korean Friendship Association! !